Thank you for the huge and warm response in regards to the Prairie Ridge Shawl kit giveaway from Infinite Twist. Click here for the Prairie Ridge Shawl information on Ravelry. Click here for the blog post about the shawl and about Infinite Twist. Click here for the Infinite Twist website. The shawl pattern climbed all the way to #7 on the Hot Right Now Patterns on the main Ravelry pattern page so thank you! I've randomly selected a winner out of the entries. The winner is.... DanaRT (rav id)!!! Congratulations to Dana! I've pm'd Dana on Ravelry to let her know she came up the winner. Dana, please email me your mailing address. Dana selected the Box of Chocolates colorway. Thank you to everyone for entering. There are many more giveaways in the works so stay tuned. Cate Carter of Infinite Twist has let me know that she has sold a ton of kits already. Thank you for ordering and supporting this wonderful company with a mission to do good in the world. Please continue to support Cate if you are able to do so. Every little bit is appreciated! Alright! I have a big and busy week ahead. I leave at the end of the week for the much awaited KnitEast retreat in New Brunswick, Canada. Click here for the KnitEast website and information! I am so excited about this event! I will be joined by fellow instructors Ann Budd, Stephanie Pearl-McPhee, Mary Jane Mucklestone, Bristol Ivy, and Deb Barnhill. What fun. There are still a few openings in several of the classes (including my Sock Yarn Bunny class). Click here to see all of the classes being offered! If you are in the area check out this amazing event. I know some of the attendees are in my Itty-Bitty Knits Ravelry group and we are looking forward to being together in person. I love when I get to be with my fellow IBKers. Okay, with all of that out of the way, let's talk about a couple of new single socks. On Sunday I put the F in Finishing on two single socks. The first sock is in the photo above. 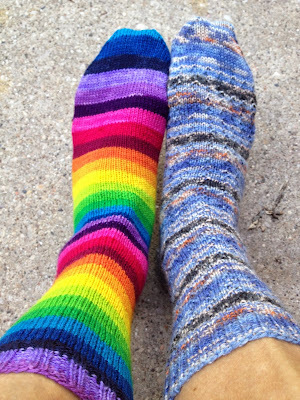 I had a long swim meet to watch on Saturday so I put a huge dent in my 15 Colour Rainbow socks from Fab Funky Fibres on Etsy. I don't need to say anything more about this yarn, just look at it. I am swooning. Perfection is found right here in this yarn. 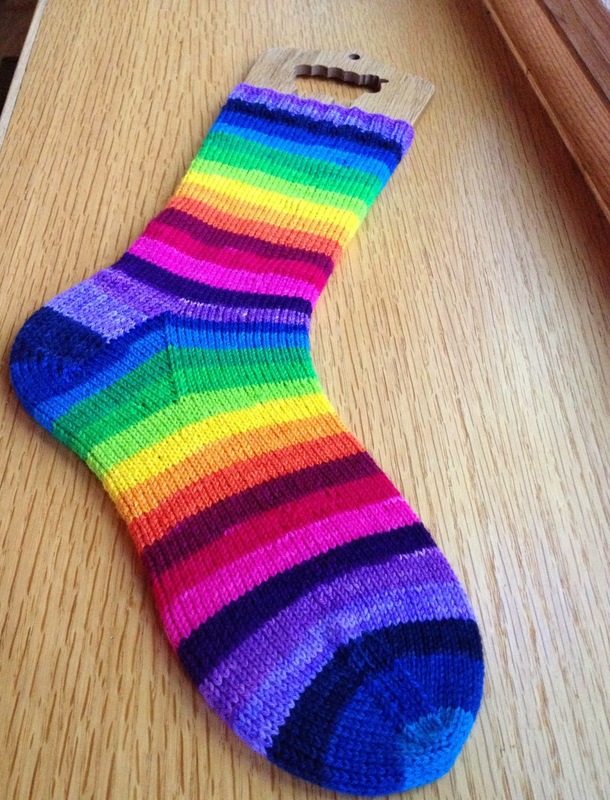 I used my How I Make My Socks free sock recipe as the pattern. 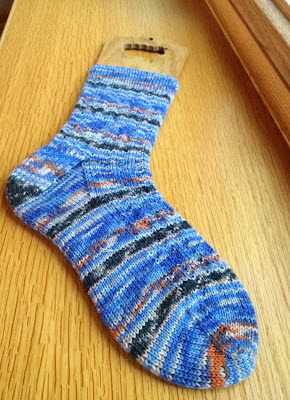 The second single sock is from the Opal Vincent Van Gogh series that I am working my way through. This colorway is Starry Night. This yarn line from Opal has been discontinued and it is increasingly difficult to find. I love every colorway found in the series. I think I have three Vincent Van Gogh colorways to go for a complete set. Look out Opal's new line called The Little Prince! I love a book inspired yarn line. I am coming your way soon. I used the Hermione's Everyday Socks free pattern for this one. It was simple and added a fun little twist. I am accumulating a big stack of single socks. I need to go back and finish up a bunch of second socks I have started so I can have pairs. In the meantime I wear mixed pairs. It's kind of fun. I hope you are all well. I'll take lots of photos in the busy week ahead to share when I return. I enjoy the Hermione's Everyday Sock pattern but have only used it with solid color yarns. 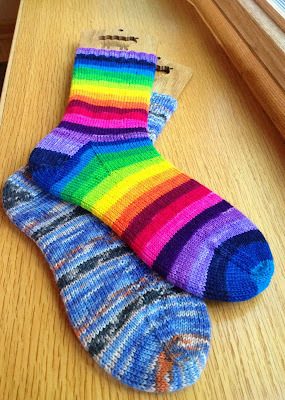 Love the idea of using Opal designed sock yarn! Nice Socks! Our three girls were on various swim teams from a very early age through high school. I was an official, so no knitting around the pool for me:( Anyway, I love the idea of knitting Hermione's Everyday Socks with Opal's patterned yarn socks. Great idea! Hi Susan, you mentioned Hermoine's Everyday Sock today! I'm knitting those as well but using Lorna Laces sock yarn in the "He who must not be named" color way! Wonder how Hermione would feel about that?! I like the rainbow ones. They're like Rainbow Brite! I think it's fun what you're doing, making singile socks first. I've thought about doing that where I make one of one pattern and then another of another pattern and then go back to the first pattern so I won't get bored. Hi Susan, Wonderful Socks! In your pattern, when you say "Cast on 64 stitches. Join to work in the round." Do I use a circular needle to do this first part?